Hello beauties, how are you doing today? Did you watch the royal wedding over the weekend? What did you think? Personally, I was cracking up over the expressions of the royals when the American pastor was preaching….teehee! All in all, the royal wedding was a beautiful ceremony and the bride looked stunning and elegant. Speaking of elegant, I wanted to talk about the Rituals Sakura Collection which fits into that category. I was visiting with one of my girlies and she needed to pick up a hand cream so, we headed to the Rituals store in Bromley. If you’re not aware of Rituals, it’s all about taking time to slow down and be in the moment. Which to be honest is needed for this busy world we live in. The Rituals Sakura Collection is perfect this time of year to help you enjoy each moment and smell the blossoms in your own bathroom. Sakura is celebrating the annual flowering of the cherry blossom in Japan. Now, if you have read my blog for a minute you would know that Japan has been on my wanderlust list and I can’t wait to visit one day soon! Mostly, to see the cherry blossoms and experience it all. After speaking with the lovely staff who are all so engaging and divine, we both ended up getting the travel sized collection. It made sense to me because who wouldn’t want to luxuriate after a long flight? The collection comes in a beautiful gift box and comprises of a foaming shower gel, shower oil, body scrub and body cream. I had used the shower oil before and absolutely loved how soft my skin felt after. As with most shower oils, your bathroom can be a bit slippery when using it so be careful! The body scrub isn’t harsh but instead a gentle texture that effectively exfoliates your body. Which is perfect for the removal of dead skin before applying your creams or tanning products. When I tried it, it didn’t leave my skin tight or dry either. Finally, the body cream makes you feel like you’re drifting away on a cloud of cherry blossoms. The scent is very subtle yet, you can smell it throughout the day. A nice reminder to take a moment and just breathe. 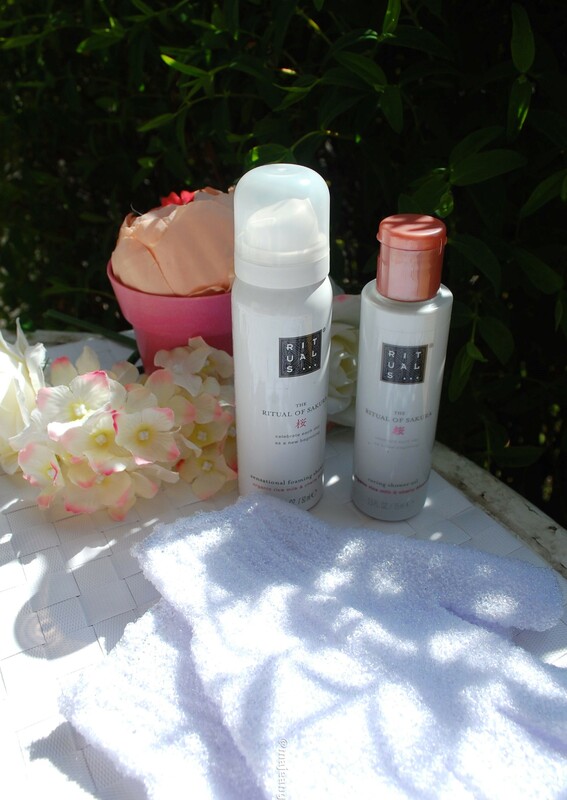 Have you tried the Rituals Sakura collection? What do you like about it? All the items in the Relaxing Treat Box are under 100ml and retails at £19.50. Go on treat yourself! That’s all from me today so thank you for reading and don’t forget to leave a comment! It tells me what you need more of.